Another fantastic low calorie, highly nutritious vegetarian dish. Just one cup of mushrooms has the potential to release at least 15 different vitamins, minerals, and phytonutrients. 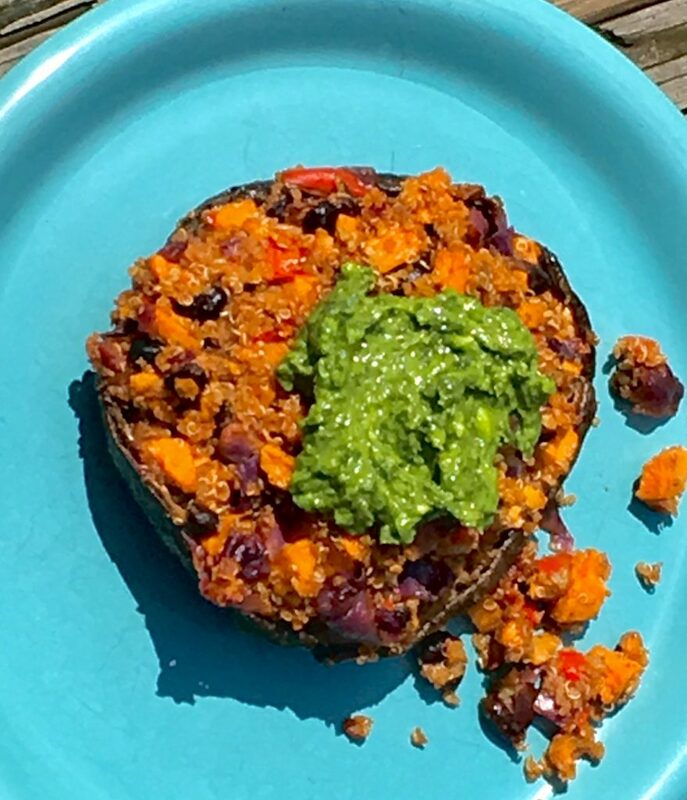 A single Portobello contains more potassium than a banana – 630 mg per serving – which helps maintain normal heart rhythm and muscle and nerve function, as well as a balance between your fluid and minerals. This, in turn, helps control your blood pressure. Buy organic portobellos where possible. Top them with a wonderful chimichurri sauce (recipe included below). These are delicious as leftovers too! If you don’t have any cooked quinoa on hand, start by following the directions on the package and combine 1/2 cup quinoa with 1 cup water or vegetable broth. Set aside. In the meantime, in a small bowl combine 2 tablespoons of olive oil, 2 tablespoons of balsamic vinegar, 1/2 teaspoon cumin, 1/4 teaspoon chili powder 1/4 teaspoon salt plus the tablespoon of lime juice. Mix well. Add mushrooms to a shallow baking or serving dish and season with the marinade. Flip/toss to combine and set aside to let marinate. Next, prepare vegetables by heating a large skillet over medium heat. Once hot, add 1 Tablespoon oil, diced sweet potatoes and bell pepper. Sauté for 3-5 minutes or until lightly browned, stirring occasionally. Add chopped cabbage, 1/2 teaspoon cumin, 1/2 teaspoon chili powder and 1/4 teaspoon sea salt and sauté for another 3-5 minutes or until all vegetables (especially potato) are tender and lightly golden brown. Transfer vegetables from skillet to a large mixing bowl and set aside. Then, to the same skillet over medium heat, add the mushrooms and sauté for 2 minutes on both sides to brown and soften. Cover to lightly steam for the final minute. Then transfer to a baking sheet face up and set aside. To the mixing bowl with the vegetables, add cooked quinoa, drained black beans, remaining 1/2 teaspoon cumin, 1/2 teaspoon chili powder, 1/4 teaspoon sea salt, and 1 tablespoon lime juice and toss to combine. Divide the filling between the mushrooms (some may overflow). Bake at 400 degrees for about 5 minutes or until mushrooms and toppings are hot and slightly browned. These are delicious topped with this easy to make chimichurri sauce: Combine in a food processor or Vitamix: 1 cup finely chopped flat-leaf parsley, 2 cloves garlic- minced, 1 shallot-minced, 1/4 to 1/2 teaspoon red pepper flakes, 3 tablespoons olive oil, 3 tablespoons lemon juice (about 1 lemon), 1/2 teaspoon each sea salt and pepper and 1 small ripe avocado-cut into chunks. Scrape sides often until you reach a smooth, creamy texture.